Tuesday 14 July 2009, the Safari passed its 21st MOT since I bought it. 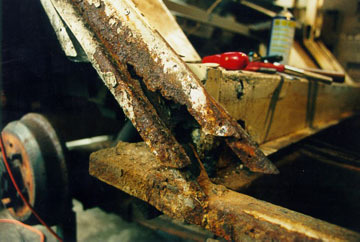 For a number of years the chassis had needed welding work to get it through the MOT and each year it was worse. 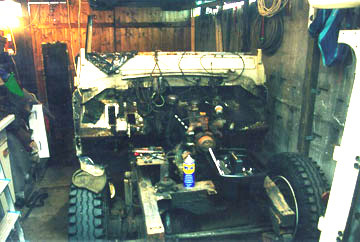 My garage had to be extended to accomodate the Safari and when that was finished I ordered the new galvanised chassis and began work. We bought the Safari in 1988 knowing the engine was a bit iffy but confident that the rest of it was fine and could be fixed anyway, hopefully!. Early in the following year I picked up a second-hand engine and rebuilt that with new pistons and a re-bore, but not a new cam-shaft. 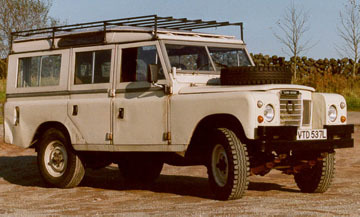 When the exemption from Road Tax for 25 year-old vehicles was introduced by Chancellor Ken Clarke I found out that the Landy although first registered in 1973 was actually built in 1972 and so was eligible for the year 1997 and fortunately still eligible after the change to vehicles made before January 1973. 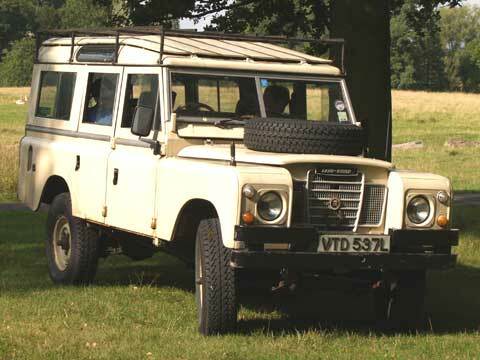 This meant that we would keep this Landy and not think about going for a later one, after 10 years of ownership it was a member of the family anyway so its survival was important to the kids as well as my wife and I. If we were intending to keep it then the choice of a galvanised chassis over a slightly cheaper painted one was not difficult. 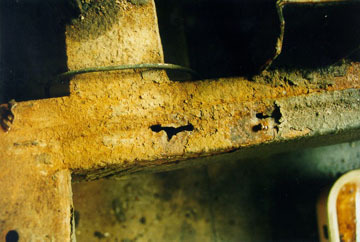 There was rust showing in various other places as well as in the chassis. The rear side-door posts were going at the bottom, the strips under the rear floor and the footwells, so we decided to take it all apart and do what we could. The roof was unbolted and suspended inside the garage roof. 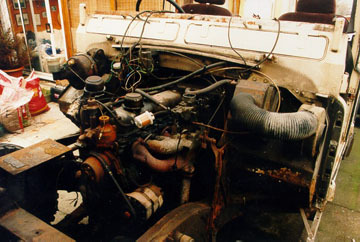 The front bumper was removed, the bonnet and the radiator grill. The rear door was taken off, all these parts were stored around the garden under plastic sheets, hopefully for not too long a time. There was some space at the back of the garage but this soon filled up and some parts were taken to the in-laws to make more room. 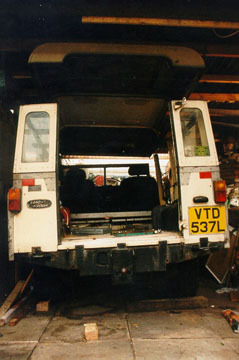 The rear lights on the Land Rover had been a source of irritation to me for years. The result of the orginal sockets corroding away and not much spare cash to replace them with proper ones. The square ones had served the purpose for a while but I was looking forward to fitting round ones again. 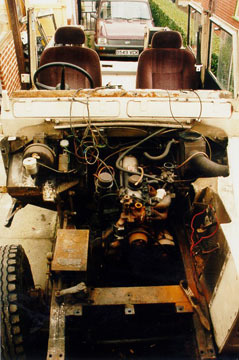 The radiator was removed and the front panel together with the off-side (right) wing. 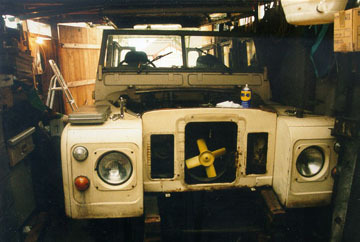 The fan had been taken off some years before and an electric fan from a scrapyard fitted in front of the radiator. I never got round to fitting a temperature controlled switch for the fan but I had an electronic temperature gauge with a remote sensor on the top hose which together with the standard temp gauge gave me an indication of when I needed to switch the fan on. The rear window panels were taken off and stored safely out of the way. 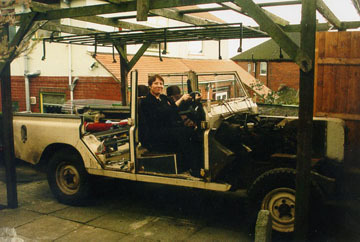 To remove the near-side (left) wing the Landy had to come out of the garage so all the family helped to push it out, couldn't run the engine with no radiator, water or battery. 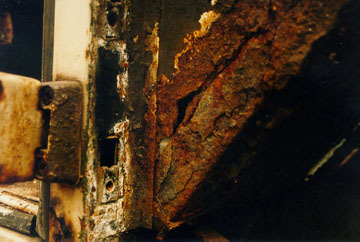 Once it was outside and the other wing was off the extent of rust and corrosion became clear. At this time I began to realise that this job was bigger than I had anticipated. The idea that a Land Rover was just like a big Meccano and could be taken apart and put together again with a few spanners and a socket set was probably fine for a new vehicle but for one that was 25 years old it just wasn't true. Apart from nuts and bolts being rusted together and requiring the use of an angle grinder to part them there was the aluminium panels which don't rust but do actually corrode in the most inconvenient places. Most of the panels were fine so some method of repair was needed as opposed to spending huge sums of money on new panels. This engine had been reasonably well behaved for the previous few years so at this stage I didn't want to do anything with it. The heater blower and matrix would have to come off at some point and I think this was the first time I had taken a close look at how it all fitted together. The brake servo would have to come off and the pedal boxes for the brake and clutch pedals. Probably the accelerator pedal and its bar would have to come out too. The drivers footwell was suffering from rust at the edge by the door post but the rest of it wasn't too bad. The frame which supported the rear side door included the angled frame which had the rear tub attached to it and the rust was quite extensive on this so replacements were ordered. The whole thing was pushed back into the garage and The rear tub removed. It only took two of us to lift it off once the ten bolts were removed which hold it to the rear crossmember. On the 109" Station Wagons and Safaris the front seat box is secured to an aluminium cross member which is in turn secured to the vertical door posts so once that is out the rusty frames could be removed, not as easy as it sounds due to the nuts & bolts being well rusted together. 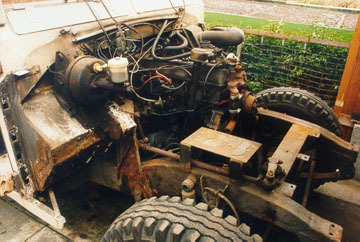 Once the heater parts and the pedal boxes were removed the steering column was unbolted (after removing the track rods) from the support bracket which comes up from the chassis and the support braket on the other side unbolted from the bulkhead, then the two long bolts securing the bottom of the bulkhead door posts to the chassis outriggers are removed and the whole bulkhead was lifted clear. 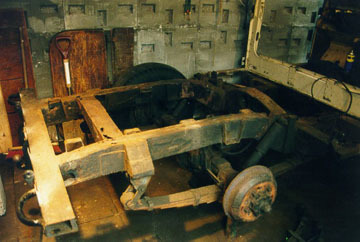 The complete chassis could now be seen and the extent of the rust was revealed. There were a lot of holes in places along the top of the chassis that could not be seen with the body parts in place, and the rear longitudinals were quite thin where the rear tube had been covering them, so it was obvious that fitting a new chassis was the right decision. 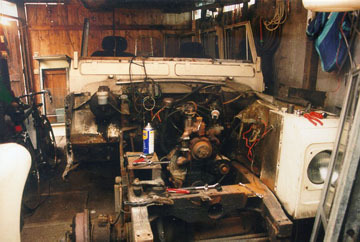 The engine and gearbox were then removed. I didn't have the space to lift them both together so the gearbox came off first then the engine was lifted out, both using a hired engine hoist. 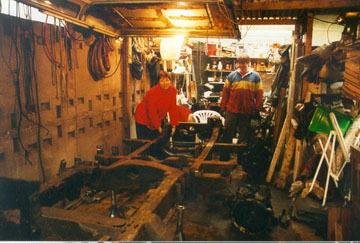 The chassis was then up on axle stands and the axles and springs removed. 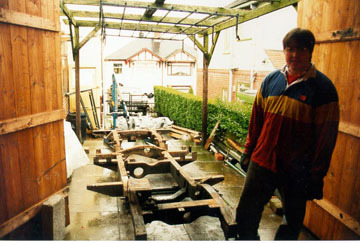 The chassis had sat in the garage until the new one was delivered then the hoist was hired for a couple of days. 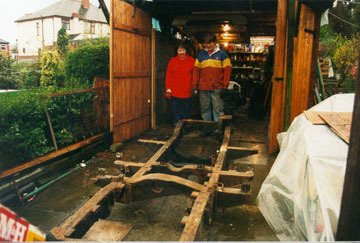 The old chassis was lifted out with the help of family and an old trolley. 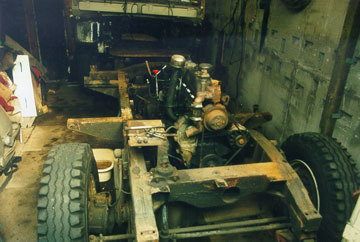 The garage was wide enough for the engine and gearbox to fit at the side but the axles stayed on the floor in the garage. The old springs were being replaced so the axles without springs didn't take up too much floor space. The bulkhead and the rear tub were outside under plastic sheeting to keep the rain off.